US, 2002, 102 minutes, Colour. Hugh Grant, Toni Collette, Rachel Weisz, Isabel Brook, Victoria Smurfit, Nicholas Hoult. It sounded rather snooty and vindictive, the capsule review of About a Boy in the Daily Telegraph: 'Rachel Weisz falls for his charms: we don't'. Charm is probably the quality that Hugh Grant usually offers on screen and has done so since the late 1980s. He himself doesn't claim to have a wide acting range but, within it, he usually exudes charm. He has appeared in Merchant Ivory films, Maurice and Remains of the Day; he travelled to Australia to be a prim parson encountering Elle Mac Pherson in Sirens; he went to the US for Nine Months and Extreme Measures, and for Woody Allen in Small Time Crooks; he was charm (both nice and nasty) in Four Weddings and A Funeral, Notting Hill and Bridget Jones's Diary. Early on, someone remembered that he had the same surname as Cary and predicted that he would be his successor. One reviewer, less peeved than the Daily Telegraph, claimed 'he dentillates!'. It is true that he has a number of what might be called 'charm-tics' - eyebrow raising, crooked grin, deprecating cough, shoulder shrug, whatever the British equivalent is of an 'aw-shucks shuffle' - and that he relies on them for the impact of his performance. 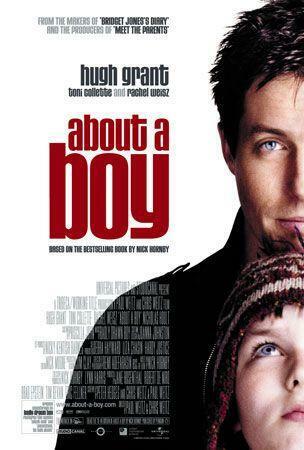 He does it all again in About a Boy, but in a less obtrusively mannered way. At over 40 and playing 38 in the film, he is the perfect embodiment of the London well-healed layabout who has made his adolescent ambitions his life's peak. Which means that he is unlike the real Hugh Grant who has made for himself an extremely successful career. While his character, Will, divides his life into blocks of 30 minutes (3 units for lunch, two units for exercise (playing pool), 3 units for buying a CD), he really does nothing at all. He proclaims his life is full. He comes to realise, however, that it has no significance, no meaning. In About a Boy, Will experiences his rites of passage over twenty years too late. This means that it is bit hard to read his character and to evaluate what this belated crisis will do for his deeper personality - which, he has been claiming, doesn't exist. He says he really is shallow. Towards the end of the film, the charmed Rachel Weisz tells him that when she first met him, he seemed, '...well...blank'. We could ask, 'what type of blankness'?. He is lack of decision-making personified. His inheritance from the royalties of his father's one-hit 1958 Christmas record means that he doesn't have to make any decisions beyond the superficial. By temperament, he doesn't make them. Or, rather, his decisions are based on whim or, sometimes, forced on him. He enjoys going out with women to fashionable restaurants and bringing them back to his flat, but most of the time he is content to stay at home, read or watch Countdown, Who Wants to be a Millionaire and Pet Rescue. His preference seems to lean more slightly towards Introversion. life. At one stage, he demurs that he almost felt something warm and fuzzy, but he was able to avoid it. He goes through life spasmodically attached to people but is, in principle, detached. Marcus and Marcus loves his mother. To save Marcus embarrassment at the school Rock and Roll concert, he joins him on stage singing Killing Me Softly, strumming the notes with his fingers, prepared to make a fool of himself. Luckily Rachel's son goes to the same school, so she sees the performance and is able to fill in some of the blanks. The screenplay, adapted from Nick Hornby's novel and directed by the American brothers, Paul and Christopher Weitz, who made American Pie, has a device to help us answer questions. It intercuts the voiceover of both Will and Marcus so that we both see and hear what they do and think. Will is presenting himself as a case study in delayed male maturity. 1. The title, the focus on boys, maturity, adolescence and growing up? The focus on Will as a 38-year-old immature boy? On Marcus as a twelve-year-old boy? The film's perceptions on childhood and childhood experience, adolescence, growth into adulthood? The needs for maturity: self-affirmation, relationships? 2. The parallel voice-overs of Will and Marcus? Each and the self-revelation? Both honest and direct about themselves and their assessment of themselves? 3. The London settings, flats, schools, streets and parks, restaurants? The range of songs? The special song for Will's income and its lyrics? 4. Hugh Grant's portrait of Will, age, experience, living alone, in his flat, wealthy, watching television quiz programs? Not being beholden to anyone? His explanation of his timetable and time efficiency, the amount of time given just to do things that he wanted to do, games as exercise _ shopping? His relationships with women? His callow attitude, his inability for commitment? His going to the meeting and pretending he had a two-year-old son in order to attract the women? What future for his life? 5. The portrait of Marcus, his age, finding things difficult at school, his inabilities at sport, his looking after his mother, his exasperation with her? His sense of hopelessness? Her emphasis on music and his trying to sing, the embarrassment at school? 6. The effect of their lives on each of them, each feeling trapped? The encounter between Marcus and Will? Marcus taking the initiative? Will's response, his being taken unawares, partly being trapped, taking some initiatives for example buying the runners? 7. His theory about isolation, the John Donne quote, "No man is an island"? Backing it up? The rest of the film showing that this could not be true? 8. His relationship with women? His going to the group, his meeting the women, his explanation of himself, his improvising and doing it well? The attraction towards Suzie? Going out with her, his explanations about his son and the reasons for his absence? The encounter at the picnic, Marcus and his throwing things at the duck, the dead duck? The meeting with Fiona? Fiona and her reactions about Marcus going to Will's house, watching the television, buying the runners? Will and his taking on more than he thought he could cope with? His relationship with his sister, going to meals, being asked to be godfather, his faux pas in explaining why he shouldn't be? 9. Marcus, at school, the other kids, the bullying, his timidity? Ellie and the beginnings of a friendship, the gang, Ali? His building up his confidence at school, the infatuation with Ellie? The preparation for the concert? 10. Marcus and his mother? Her mood changes, her behaviour at home, getting up, the meals, weeping? Her going to the meetings? Her love for her son, unable to give him the support he needed? The music and the singing? Her going to the meetings? The shops? Will at the restaurant, her attack and making a scene? Her suicide attempts? The confrontation, the songs? 11. Will, the bonds between him and Marcus? His being transformed? Marcus being transformed? The truth about his not having a son, Suzie finding out the truth? 12. Will and Fiona, the set-up meeting, their clash and incompatibility? Fiona and her change of heart? Allowing Will to be a foster father to Marcus? Will, his finding the limits of his abilities, not wanting to advise Marcus in serious matters? Marcus being hurt? 13. The build-up to the concert, Will's realisation that Marcus would make a fool of himself, Marcus getting on stage, "Killing Me Softly", for his mother, the laughs and jeers, the humiliation? Will coming on stage, singing the song with Marcus? The success? 14. Rachel, her son, the relationship, Will and his being attracted to Rachel? The son and his friendship at school, the initial clashes, the understanding, Ellie and the rest of the gang? Their support for the concert? 15. Rachel and Will, the truth, the Christmas celebration, everybody present, the father, the mother-in-law? The interactions, the extended family, happiness? 16. Themes of parenting, relationship between adults and children, the needs of children, the needs of adults? Marriage and commitment? A humane comedy?